Welcome to Japan! I'm Tomoko, a Japanese calligrapher and designer. I used to teach Shodo at an elementary school in the United States. I have a very clear memory of when the students were excited to write their names in Japanese. They were full of joy as they wrote their names with a brush and ink for the first time. Therefore I decided to convey the spirit and mind of Shodo in a fun and entertaining way. I'm looking forward to seeing you in Tokyo! 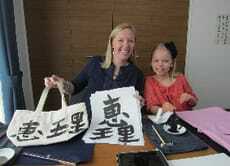 Enjoy Japanese Shodo calligraphy in Asakusa!